Elegant home w/owned solar in desirable Bressi Ranch. Granite center island kit w/GE Monogram appliances, double ovens & walk in pantry. Family room w/fireplace. Master suite w/dual basins, oversized shower, soaking tub & walk in closet. Peaceful yard w/grassy area, covered patio & waterfall. Loft could be 5th bed. 1st floor bed & bath. Walnut wood floors, neutral carpet, 3 car gar, dual AC. Residents enjoy resort style pool, spa & BBQ area. Walk to Bressi Ranch Village Center. 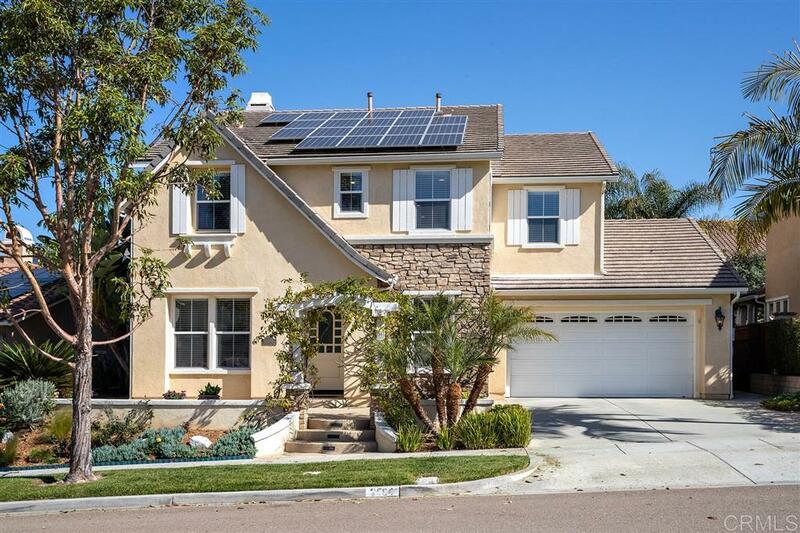 Top rated Carlsbad schools., Elegant home with owned solar in highly desirable Bressi Ranch. Located on a quiet tree lined street that is walking distance to fantastic shops and restaurants at the Bressi Ranch Village Center. This luxurious residence features a gourmet kitchen with expansive center island, top of the line GE Monogram appliances, double ovens, granite countertops, walk in pantry, built in desk, and breakfast area. The kitchen flows seamlessly into the expansive family room with raised hearth fireplace and built in speakers. The spacious master bedroom suite features dual basins with mosaic travertine backsplash, a soothing soaking tub, an oversized shower, and a huge walk in closet. Outdoor spaces include a peaceful backyard with grassy area, covered patio, brick terraced garden area, and pondless waterfall. There is a wonderful upstairs loft that could easily be converted to a 5th bedroom. One of the upstairs bedrooms is extremely spacious with room for a seating area, and could be perfect for siblings who share a room. The upstairs hall bathroom features dual basins. A bedroom suite is conveniently located on the first floor with attached bath and walk in closet. Gorgeous walnut wood floors can be found throughout the downstairs with neutral carpet upstairs. Stylish paint colors highlight many of the private rooms with neutral paint colors in the public rooms. Other features of the home include a 3 car tandem garage, upstairs laundry room with sink, tall baseboards, dual AC, and multiple rain barrels. 19 panel solar is 3 years new, and carries a warranty for 17 more years. Owners had zero electric bill each month, and received a $35 credit with solar at the end of the year. Residents enjoy a resort style community area with pool, spa, children's wading pool, and BBQ areas. Students attend top rated Carlsbad schools. Minutes to beautiful beaches and world class golfing. Come live the ultimate Southern California lifestyle!